Children whose diets include lots of fruits and vegetables lower their risk for heart problems when they become young adults, according to a study published in Circulation: Journal of the American Heart Association. Using data from the Cardiovascular Risk in Young Finns Study, a long-term study that followed Finnish children ages 3 to 18 for 27 years, researchers compared lifestyle factors and conducted a measure of arterial stiffness to follow 1,622 participants in the study. The measure– pulse wave velocity– reveals the stiffness of arteries and is associated with atherosclerosis. Atherosclerosis is the process by which arteries get clogged with deposits of fatty material, cholesterol, calcium and other debris and create plaque. Plaque can harden and clog the arteries or it can become fragile and rupture causing a blood clot to form. If the blood clot blocks vessels to the heart it can cause a heart attack and if the clot blocks vessels to the brain it can cause a stroke. "Atherosclerosis is a slow, complex disease that typically starts in childhood and often progresses when people grow older," says the American Heart Association. Children who regularly ate more fruits and veggies from childhood to adulthood had an average 6 percent lower pulse wave velocity compared with those who ate the least fruits and vegetables, showing more flexibility in their arteries and lower risk for heart disease. Eating fewer vegetables in childhood was associated with higher pulse wave velocity as an adult, remaining constant even when adjusted for heart disease risk factors such as HDL (good cholesterol) and LDL (bad cholesterol). Unhealthy lifestyle risk factors in childhood, including low vegetable and fruit consumption, low exercise rates, and smoking were directly associated with higher pulse wave velocity as an adult, and remained even when adjusted for lifestyle risk factors in adulthood. "These findings suggest that a lifetime pattern of low consumption of fruits and vegetables is related to arterial stiffness in young adulthood," according to Mika Kähönen, M.D., Ph.D., senior study author from Tampere University Hospital in Tampere, Finland. "Parents and pediatricians have yet another reason to encourage children to consume high amounts of fruits and vegetables." The authors note that their study has limitations. The data from the study were based on respondents and their parents filling out food frequency questionnaires of monthly food consumption, rather than daily, which might cause underestimates. The study also only included white European participants. Make shopping for produce fun by visiting local markets or grocery stores and showing children how to choose ripe fruits and vegetables. Involve children in preparing meals– teach them how to measure, and handle some of the ingredients. Be a role model by eating and enjoying a wide range of fruits and vegetables and encouraging your kids to try new flavors. Try growing your own fruits and vegetables. 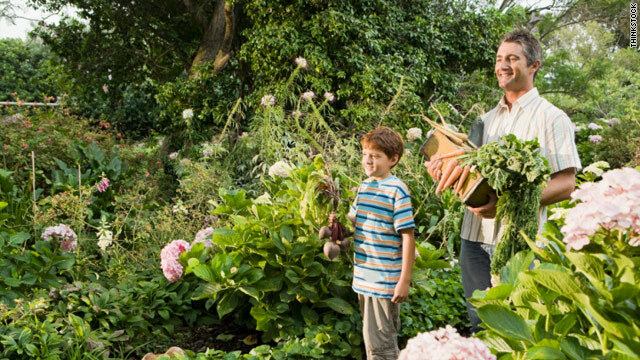 Create a kitchen garden and let your kids plant herbs, tomatoes and other foods that are fun to grow and eat. If you're having trouble getting kids to eat more vegetables try surprising them by including grated or pureed carrots or zucchini into pasta or pizza sauces or in muffins. Casseroles can also include vegetables in a way that may not be as obvious. Be patient– while your kids may push back at first, they may discover that pasta with shredded zucchini is their favorite dinner. Allowing your children to eat more organic vegetables and fruits can help prevent and cure diseases. I agree to the article about growing your own kitchen table herbs or indoor vegetables to encourage children and young adults to appreciate their own grown greens. No! Really? Look if you hear sarcasm in that, you are right. It takes testing for humans to understand that a well balanced diet of local organic vegetables that don't have all sorts of chemicals dropped in them and aren't picked weeks before they are ripe is actually good for you and the human body? And convince your kid to eat veggies and fruits? It was simple for me. If I wanted dessert I had to eat at least half of my vegetables. I was allowed to hate 2 vegetables but I had to eat a sub for them at the meals. We didn't negotiate and kid friendly was not a word in our family. I grew up willing to try anything without the politics and drama. Mom knew if I said I hated it, I really hated it. And from the waist line of many of the kids I see waiting until breakfast if they won't eat dinner won't hurt them one bit. And neither will missing dessert. It is ridiculous that someone paid for a STUDY to come to a conclusion that has been Common sense for a long time. We only had fresh seasonal vegetables and our parents were clever enough (albeit not Academically enhanced) to not just encourage good diet, but MANDATED the situation. Our children followed suit since they were raised on a Truck Farm. And to dispel a Socialistic Myth...fresh vegetables are affordable in the US for Everyone regardless their Income Level. I agree that it's pretty sad they spent the money for this study, but it's even more sad that there people are not adhering to it! I hope many people read this article and change what they feed their children and themselves. It's so sad how the line is always full at McDonalds and children are eating frozen nuggets and fries at home. Increasing your fruit & vegetable servings is crucial for optimal health? Meeting the recommended servings of 9-13 is hard to eat everyday, every week and every month. Juice Plus+ is a great way to brigde that gap and independent medical research by over 22 universities from around world confirm how important fruits & vegetables truly are for proper cellular function. Where else can you get 17 different F&V into your body for less than $1.50 per day? Proven to decrease oxidative stress, protect our DNA, boost our immune system, positively impact cardiovascular wellness and improve our vanity; JP+ is the next best thing to F&V and a staple in my families nutritional game plan. Get all of your vitamin and phytonutrients needs through 100% whole food nutrition JP+. Contact me with any questions or concerns. Take the time and browse my site to see for youself. All test results are available and published in peer reviewed medical journals. If Chicago's latest crop of chic restaurants is any reading, we think Chicagoans are in condition to be gone those winter blues behind, gather their troops, and pursue out waggish grub and sport times. From a suburban steakhouse to goth-store-turned-cafe, Chicago top restaurants 2018 current restaurant openings are nothing if not diverse. Lower down we've rounded up an updated register of the young restaurants in borough this month - or if you're hungry exchange for an old standby, keep scrolling in search our reported lineup of the overall pre-eminent places in Chicago to collar your devour on.